Father John LaFarge sought to educate Americans in order to eliminate the ignorance that underpinned prejudice and discrimination. His article entitled "What is Interracial?" appeared in the March 1933 edition of the Interracial Review and explained the meaning and value of interracial activity. According to Father LaFarge, what does interracial mean? 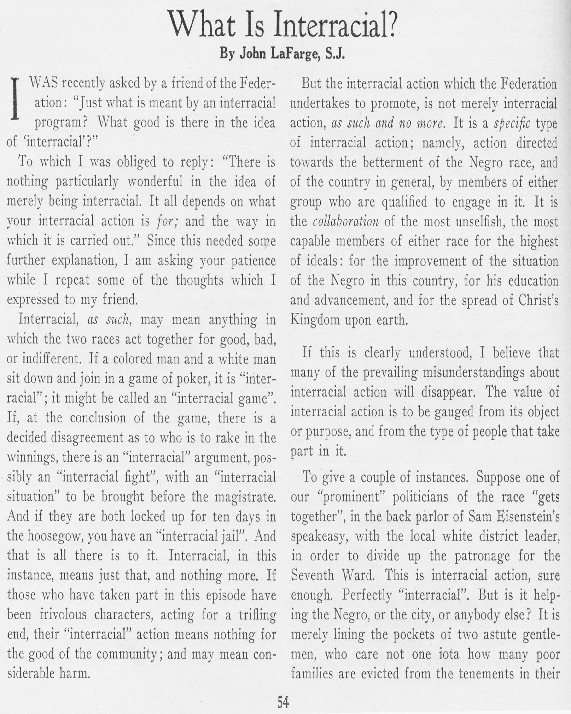 What does it mean when he stated that the action of the Federation was "not merely interracial action." What does Father LaFarge consider necessary for "the guarantee of a successful interracial program?" Does Father LaFarge argue that the Federation should be exclusively interracial or does he believe that some racial activities remained necessary? Explain why you agree or disagree with him and include conclusions you have drawn from reading the draft of Turner's editorial and his editorial (Documents ten and eleven).